Ever wanted to travel through time, become a master at martial arts, eat soup and own a primate, a castle and a starship? Then this is your game! 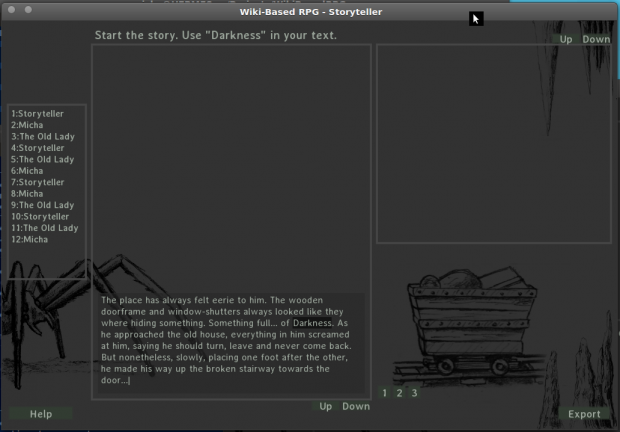 Wiki-Based-RPG is an open source, text based game, with somewhat experimental gameplay. The server writes a story - based on key words which the game gets from Wikipedia (or any other wiki, if you modify the code a little). 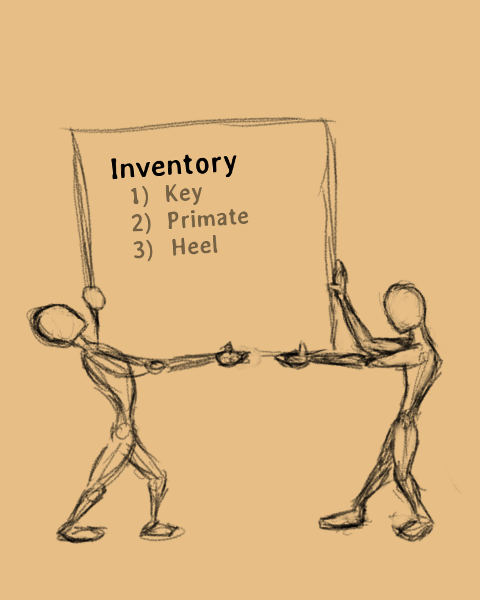 Between every two story sections, the heroes (the players) are allowed to reply by saying something, doing something or using something from their inventory. No two stories are alike, but all stories are guaranteed to be crazy! At the end, you can export the story directly to .html and show your friends, post it, or send them to me so I can post them here! I'm proud to release the next version of the Wiki-Based-RPG, which has been uploaded and should be authorized soon. As always, you can also get it right from gitHub. Clients can now randomly get the chance to choose the word for the storyteller to continue the story with. Give him the word "Orange-Juice", and he'll have to deal with it! Languages: The game can now be translated more easily. Simply make a new language file and the game automatically finds it and gives the players the language as an option. I Enhanced the text input a little. Not only are unicode characters now supported (see Readme for details) but you can finally click-to-edit the text and use the cursor up/down keys. Bug fixes, bug fixes, bug fixes. Translating should take less than 30 minutes. This game is best played in your own, native language, but I only speak so many. I'd greatly appreciate it if you could translate the game into your own language. I tried to make it as easy as possible by putting all the language strings into a simple file. There's also example files in German and English. Instructions on translating are in the Readme in the .zip file. So send me your translations! Details on how to get the game to run. For running the source code, check out the Readme file. Now featuring themes, multiple languages, and lots of bug-fixes! This is version 0.5. To run the game, change the extension of the file from .zip to .love, then launch using the Löve2D Engine. how do you start up a server? There's a description of how to do that in the Game's help files. If you're playing in a LAN, simply click "start server", find out your IP address (see: De.answers.yahoo.com) and let others connect to it. If you're behind a router and want to host through the internet, it's a little more involved: You need to forward port 8080 on your router, so that incoming packages know that they should go to your pc. Then visit a site like: Whatismyip.org and give your ip address to those who you wish to connect to your game. Played with this last night and really enjoyed it! A simple suggestion that could improve usability: add distinct sounds after other users' actions. Right now, there's a chime when you're presented with a choice of words. It would help if there were also sounds for when someone posts a paragraph or a chat comment. Since it can take upwards of five minutes for someone to respond, I often was doing other things. A chime could bring me back to the game. Also, there might be bug. Every game I play, I'm forced to select "Case Sensitivity" as my first word. This is a problem, because I do not know how to filter this page yet. I'd have to find something that is on each of these pages in all languages which I can then search for. That way I could instead display "word not found" or something like that. Thanks for the tip! That'll help a lot. I should note that the server cannot enter an unknown word, as the game rejects it and offers alternatives. The problem must happen when the players enter unknown words in their description. I'll be sure to encourage them to use known words from now on. Ah, that might be a bug then. I'll check it when I find the time, thanks!